The year of 2011 saw a lot of growth in many ways for the Capital Entrepreneurs community. Existing Capital Entrepreneurs companies grew revenue, employees, and expertise. Many new companies were launched, and the entire scene as a whole saw a lot of positive growth. Madison was rated as the most educated city in America, one of the top cities for young adults, and one of the top 10 cities to start a business. Young, smart people are the cornerstone of the Capital Entrepreneurs community, and Madisonâ€™s role as a top startup hub continues to grow. Capital Entrepreneurs more than doubled in size over the year and has over 150 member entrepreneurs. Capital Entrepreneurs companies now employ over 200 full time and nearly 100 part time people. In 2011 alone, these companies created 121 full time jobs, 66 part time jobs, and raised $23.7 million in funding. The direct economic impact of Capital Entrepreneurs companies continues to grow as they create new jobs, bring in new funding, and create new revenue streams. Capital Entrepreneurs companies are curing cancer, preventing suicides, and organizing community groups. They are making mobile apps and games used by millions, revolutionizing the digital music industry, making sense of social media, shaping some of the worldâ€™s largest brands, and much more. Capital Entrepreneurs companies participated in prestigious startup incubator programs including Y Combinator, TechStars, Startup Chile, and 94labs. Over the last year, Capital Entrepreneurs companies were featured in news outlets around the globe. These included The New York Times, NPR, Mashable, TechCrunch, CNN, The Economist, The Wall Street Journal, Wired, MTV, Sports Illustrated, AdAge, and more. Locally, Capital Entrepreneurs companies were the topic of two Isthmus cover stories, and were featured in the Wisconsin State Journal, Madison Magazine, and InBusiness. Capital Entrepreneurs members gave talks at TEDxMadtown, were featured on panels at the Wisconsin Early Stage Symposium, Accelerate Madison, and the Wisconsin Science Festival, and many Capital Entrepreneurs members have emerged as some of the top experts in their fields. Multiple Capital Entrepreneurs companies were also recognized as Qualified New Business Ventures by the State of Wisconsin. Capital Entrepreneurs organized Build Madison, a 24 hour community create-a-thon that took place in both February and September. Each event drew over 60 people that came together to work on some awesome projects and compete for $1000 in prizes. Sponsors included Google, Sony, plus more, and multiple projects turned into real companies. The 2nd Annual Forward Technology Festival took place in August and was organized by Capital Entrepreneurs members. The ten day festival showcased Madisonâ€™s entrepreneurship and creative community. The festival included events throughout the city, a multi-day Madison Ruby Conference, and was headlined by the Forward Technology Conference. The conference had record attendance and featured top thought leaders and entrepreneurs from Madison and beyond. Capital Entrepreneurs companies saw a lot of success in 2011 and Capital Entrepreneurs continues to serve as a cornerstone of the Madison entrepreneurial community. There is a lot of excitement going into the new year, and 2012 should prove to be another action packed year for the Madison Startup Scene. Are you an entrepreneur? Madisonâ€™s a great place for startups, and Capital Entrepreneurs is a great family to join. The year of 2011 was a fast paced and exciting one at PerBlue. Our company and products both saw huge growth, and we transitioned from a small startup to a growing company. We started the year with 12 full time employees in a brand new office space that had so much room we didnâ€™t know what to do with it all. Weâ€™ve ramped up quickly and now employ 36 full time people, including developers, artists, analysts, support, and more. N00b lunches were frequent and for much of the year we were adding a new employee each week. During the Summer we had some awesome weekly grillouts and played a lot of volleyball and Frisbee. We had a ton of fun (especially Halloween), and for Christmas everyone got a Wii. In the world of Parallel Kingdom, we completed a number of milestones. We cleared 500,000 players in June, and we celebrated 1,000 days of gameplay in July. Much of the year was spent focusing on making Parallel Kingdom the best location based RPG in the world. We saw a lot of success and are now closing in on 1 million players. We were a finalist for Best Mobile Game in the Mashable Awards, rated as one of the top 10 Best Mobile MMOs, and also rated as a top 10 Best Cross-platform Multiplayer Mobile Game. Parallel Kingdom held a number of innovative in-game events throughout the year. We introduced virtual Trick or Treating where players could go house to house and collect candy – or potentially spawn a dangerous Monster. We covered the world in virtual snow that could be used to throw snowballs or build snow forts. We even provided over 3,000 real world meals to children and families in need through in-game Thanksgiving and African famine relief charity drives. 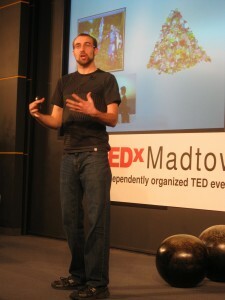 Our CEO Justin Beck spoke at TEDxMadtown where he gave a talk on social games and virtual currencies. Justin also gave a presentation at this yearâ€™s Forward Technology Conference, and presented his College 101 advice to freshman engineers at the UW. Brand Director Forrest Woolworth was on a panel about entrepreneurship at the Wisconsin Science Festival, and Justin and Forrest anchored another entrepreneurship panel at the Wisconsin Early Stage Symposium. We participated in Accelerate Madison, helped organize and sponsor Build Madison, were part of numerous UW campus events, and even organized a holiday board games drive to benefit area hospitals. We attended conferences all over the world, including the main GDC in San Francisco, GDC Europe, and GDC China. Justin was even selected to present the PerBlue story at the 2012 GDC in San Francisco. We definitely had an exciting 2011, and we have a lot more exciting things in store for 2012. Follow along on the PerBlue Blog, Facebook, and Twitter. For Networked Insights, 2011 was year of significant milestones, growth and validation. We received marketplace support from clients, the media and the investor community. We cleared a number of hurdles that startup endeavors face during their early stages. And we entered 2012 with incredible optimism about the path ahead. For the third straight year, Networked Insights enjoyed dramatic revenue growth based on the growing number of deals we signed with companies of various sizes. We formed new client relationships with household names such as MTV, Samsung and MillerCoors. Through our work with these and other clients, we helped influence approximately $5 billion of advertising investments. Our clients achieved significant marketing performance gains in part because of the insights our work produced. They also benefitted from the exceptional customer experience delivered by Networked Insights, a result of the emphasis we placed on building a first-class client services team in 2011. Our client retention improved dramatically and was nearly perfect in 2011. Overall, Networked Insights grew at a breakneck pace in 2011. When the year started, we had roughly 25 employees, nearly all of which were housed in our Madison office. By year-end, we had 73 full-time personnel, significant offices in Chicago and New York, and a strong presence in Toronto, Houston, Atlanta and Denver. A national public relations effort produced new exposure levels throughout the year. There were frequent mentions across both large and niche publications such as Esquire, Mashable, MediaPost, AdWeek, AdAge, CNN, Wall Street Journal, Sports Illustrated, LA Times and the NY Times. Our company was also prominently mentioned in two hardcopy books published in 2011: Listen First!, by Steve Rappaport, and The Successful Marketing Plan, 4th Edition, by Roman G. Hiebing Jr., Scott W. Copper, and Steven J. Wehrenberg. Finally, one of the most exciting developments for us in 2011 was the interest and support we received from the investor community. In addition to continued support from our great local investors who have been with us from the beginning, we also were fortunate to bring on Goldman Sachs Investment Partners as the lead investor of our $20 million Series B round of financing, which closed in July. Through the course of their due diligence, the team at Goldman Sachs was impressed by our staff, vision and underlying technology platform. They are now committed to being a part of our long-term growth plan. The success of the Series B financing was a great tribute to the way we have overcome challenges in the past and seized opportunities that have arisen, and it is a strong signal that there are many great things ahead of us in 2012 and beyond. Looking back, Murfie had a roller-coaster year. (We know, we knowâ€¦it’s a tired clichÃ©.) Like any first-year startup, we had our ups and downs, but we made it through without falling out of the car. We tried to ride high, with our hands up in the air. We tried to keep pace. We tried to do a few celebratory fist pumps here and there. Moving into 2012, we’ll be doing a whole lot of somethings. We’re looking to fine-tune our mission statement and value proposition. We’re looking to continue building a complementary, cohesive core team. (This one’s important, so let’s take a pause. Business models may shift and ideas may change, but smart people are always valuable.) We’re looking to make all our operational processes more efficient. Above all else we’re looking to reach a larger customer base: we’re excited to connect with folks who want to be part of a media landscape that is ever changing. The question of ownership versus access will continue to take center stage, and we plan to stay at the forefront â€“ making our unique stamp on the digital music revolution. Prevented 17 potential college student suicides. Grown from one person to 6 team members, filling voids in technology, business development, data analytics, chapter management, and customer relations (sales). Expanded to over 20 schools, with a few big dogs like MIT and UC-Berkeley! Completed the TechStars 3-month accelerator in Boston, broadening our network substantially and allowing us to raise capital. Raised $420,000 in equity financing from angels across the country. Check out our TechStars Demo Day presentation to see the pitch! We received outstanding feedback about our Student Behavior Analytics in presenting them to schools who have been using Spill for 1 year. We’ve now started collecting ethnicity and sexuality information, as well. Some of the schools are on board to purchase analytics next semester. Created a Board of Directors, made up of John Wiley (UW-Madison Chancellor Emeritus), Laurie Benson (Former CEO of Inacom Information Systems, Dr. Michael Spierer (Clinical Psychologist in Dane County), and Rimas Buinevicias (Former CEO of Sonic Foundry). Re-defined our business model, established a scalable sales model, and generated early revenue. Built a stable and reliable website, and are now beginning the process of redesigning it based on user feedback and testing. Partnered with a Crisis Counseling Center (under National Suicide Prevention Lifeline) who is now screening all incoming spills for “red flag issues,” and Allowing that student to chat with a counselor online immediately if the issue is serious. Participated in an Expert Panel for the Suicide Prevention Resource Center, and defined our crisis protocol. Begun testing the military market and defining our messaging. We will likely tackle that hurdle after we solidify the school network. Gotten a lot of great press in places like: The New York Times, MTV, TechCrunch, The Wisconsin State Journal, National Society of Collegiate Scholars, TheNextWeb, The Boston Globe, YPulse, TrendBabble, and many more! We have big goals for the 2012, and would love your help in achieving them. To give you a brief idea, we plan to expand rapidly to 100 campuses, increase student engagement by 5x, establish ourselves as the national standard for peer support, sell and publish white papers on our data analytics, raise our second round of financing, and expand into the military and veterans’ groups. Thank you for your support, Madison! Email heidi@spillnow.com if you would like to help us on our journey or sign up for a monthly newsletter. We look forward to continuing to make life better for college students. Remember: You’re not alone… You just haven’t been connected yet. Our first year in business was eventful and exciting, to say the least. After incorporating in late fall of 2010, we successfully built and launched the beta Fishidy.com platform, a location-specific social network dedicated to anglers. We hired a team to work on Fishidy, full-time, and developed lasting relationships with some well-known brands and companies within the fishing industry. Some of those new relationships and partnerships include, Fishing Tackle Retailer, North American Fishing Club, PowerTeam Lures, ESRI and Rand McNally. Weâ€™re thrilled to have the opportunity to work with many of the great companies here in Madison as well, including Shoutlet, Neider & Boucher, Weather Central and Planet Propaganda just to name a few. In July, we launched our beta version of Fishidy.com (1.0)…only a few months late! Our initial development was often grueling, but also truly rewarding and exciting as we created new, innovative ways for anglers to connect with each other with waterways and with fish! Our beta launch occurred just in time for the 2011 ICAST show, the fishing industryâ€™s largest tradeshow attended by over 8,000 fishing-related businesses. Fishidy was a hit at the show — we received major props from such fishing legends and personalities as Mike Iaconelli, Chip Leer and Sammy Lee. NBC Sports featured us in a short video and we even got some love from our friends in the Netherlands. 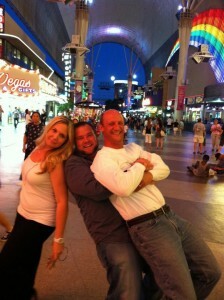 It was a successful show and some of our team members even found time to enjoy the Vegas nightlife… maybe a little too much. Since ICAST weâ€™ve been busy beta testing and conducting intensive development sprints all in preparation for our big re-launch set to occur this spring. Our beta testing process has been incredible. Not only have our testers provided incredible feedback, we also added nearly 6,000 users to the site! We were lucky to add two, new, rock star employees in our Madison office. Carie Wlos is our new director of marketing. Sheâ€™s a social media junkie and loves the challenge of developing and branding a new social product to the masses. Drew Gierach is our new front-end developer. And, while he doesnâ€™t sleep very often, he definitely brings a lot to the table in regards to user experience and has a keen talent for writing clean, efficient code. Carie and Drew joined the existing “scattered” Fishidy team located in Madison, Philadelphia, Virginia Beach, Harrisburg and Rhinelander. Developing software remotely is a huge challenge but utilizing tools like Campfire has helped us overcome this challenge. We continue to receive critical support from are two major business partners, Fishing Hot Spots and GeoDecisions. While 2011 was an amazing year, 2012 looks to be even more exciting. Weâ€™re set to move into our new digs on the far west side of Madison early in the year. 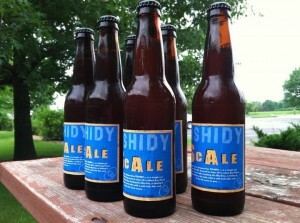 Weâ€™re also preparing some big things for Fishidy.com in 2012, including the re-launch of our site, the launch of a mobile application, adding to our growing staff here in Madison, and maybe even brewing up another batch of that delicious Fishidy brew appropriately named Fishidy Scale Ale! Check us out and stay up-to-date on all the new features we add to Fishidy.com. The year of 2011 was a building year for Optimal Media Group as we completed our second year of operations and are maturing as a company. We saw a steady growth in our core product, the city specific NightOut website, of 5 to 10 new cities per month which we project to continue and increase in the coming year. We added many upgrades both in the user interface and in the administrative area which improved functionality, user friendliness, speed, and also simplified many daily administrative operations. We also added many key product features to compliment our core business. One of the most exciting and innovative additions is our MyNightOut phone app which keys on the specials and events posted on our site. The app geo-tracks the user and displays the specials and events by proximity sorting by the closest listing to where the user is standing. Very cool feature. The app also allows search capabilities so you can search specials and events all over North America and link to your desired merchant with ease either by phone or to their website. We have added NightOut Storage which allows our licensee to store large amounts of data such as photos or video without sacrificing load speeds all while improving site SEO. We have upgraded and improved our NightOut Radio, which used to be a third party feature, to allow local independent bands or solo artists to upload their original music easily and to allow their music to be played on NightOut sites all over North America. Never has it been easier for a local artist to receive national and international exposure. In late October we announced the release of our newest product Once In A Blue Moon. Deals so good they only come around Once In A Blue Moon is a deal site that will focus on providing 50 to 90% discounts on a variety of things specific to our NightOut genre. We will focus on providing unique, quality offers unlike any other deal providers. This is a perfect addition to our current marketing service and we expect tremendous growth and exposure in 2012. And finally we are closing the year completing the final development of an upcoming product, Cambio. It will be released in early 2012 and will be added to all NightOut sites. Cambio will provide the user The Power to Pick Your Price and will be a fun, interactive way the user receive discounts on an unlimited number of products and services. With the addition of Once In A Blue Moon, the upcoming release of Cambio and the addition of more support and training staff, 2012 will be a very exciting year for Optimal Media. We had tremendous growth in 2011 both in users and in our services offered and are extremely well positioned for our most dynamic year yet. We are very excited. To bring us into 2012, we’ll be looking back at 2011. There were a ton of amazing things that happened in 2011 with CE and we’d like to share them. 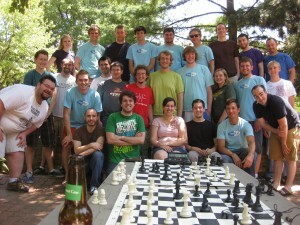 Next week we’ll kick off a series of posts from CE companies summarizing their year in review, and we’ll cap it off with a full 2011 Madison Startup Scene Recap post. To get things started, check out the New Year’s Resolutions for Entrepreneurs post that was featured on Tech.li from PerBlue’s Forrest Woolworth.